Choose the Best Side of your Pineapple. Start with a ripe pineapple. When purchasing, look for nice color both in the leaves and the skin. Check for ripeness by lifting the pineapple by a single leaf (choose a leaf toward the top). If the leaf comes out, it's ripe. Try this test several times on the same pineapple. Avoid buying pineapples whose skin is easily indented, which may mean they are overripe. Also, the pineapple should have only a very light scent. A heavy scent is also a sign of overripeness. Now lay your pineapple on a counter or table. If you are planning to carve the pineapple into a "boat", turn it to find the most attractive and stable way for it to lie (will it lie flat, without tumbling over?). Also, choose the side with the best-looking leaves. Rotate the pineapple slightly. Using a serrated knife, begin to make a slice (no more than 1/4 of the pineapple) down along the side to remove the skin. Note: Do not cut the leaves. Completely slice off the first side (skin) of the pineapple. Discard this side. If you are planning to create a pineapple "boat" out of your pineapple: continue on to the next step (step # 3). If you are planning to simply enjoy the fruit (without making anything of the pineapple shell): Continue slicing off the skin in the same way. Rotate the pineapple after each slice and continue cutting until all the skin is gone. OR, hold the pineapple vertically (leaves uppermost) and slice downward, whatever is easiest for you. When you have sliced all the way around the pineapple, check the fruit for any remaining skin (some "pockets" of the skin may still remain) - slice these off too. The pineapple is now ready to be cut up and eaten. Place the fruit on its side and slice it into approximately 1/2 to 1 inch thick slices. Once you have these pineapple "rounds", you can either slice each round into quarters or cut each round several times to create chunks. If desired, you can remove the fibrous center as you cut (to create pineapple "rings"), although I like to eat this part too, as the fiber is good for you and also very delicious. Cut Around the Inside of the Pineapple. To continue carving the pineapple to create a "boat": Cut around the inside of the pineapple, following the "rim". Cut deeply, but try not to let your knife go through the skin to the other side. Cut the Pineapple Flesh into Cubes. 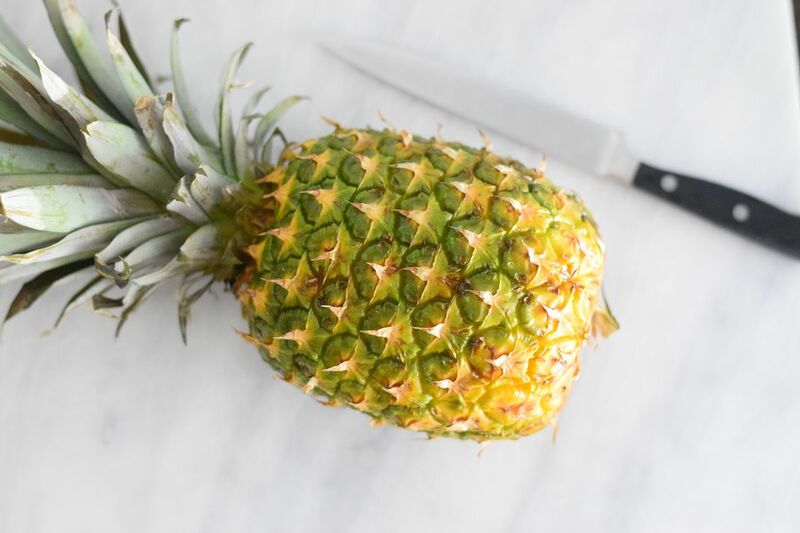 Now cut the flesh inside the pineapple into cubes, first by making long slices down the length of the pineapple, then cross cross-cuts approximately 1 inch wide. Again, be careful not to cut through to the other side. Scoop Out the Fresh Pineapple. Using a large spoon (preferably one that has a fairly "sharp" edge), scoop out the flesh and set aside. When you get to the bottom, you may have to use some muscle to scrape out the last of the fruit. Use the fresh pineapple cubes you just scooped out to create a fruit salad or other recipes, or simply to eat on its own. Store extra fruit in an airtight container in the refrigerator for up to 5 days. Fill Your Pineapple "Boat" with Fruit Salad or Pineapple Fried Rice. Your pineapple boat is now ready to be filled with a tropical fruit salad, such as Easy Tropical Thai Fruit Salad or Heavenly Pineapple Fried Rice. Both of these recipes make for crowd-pleasing party dishes.